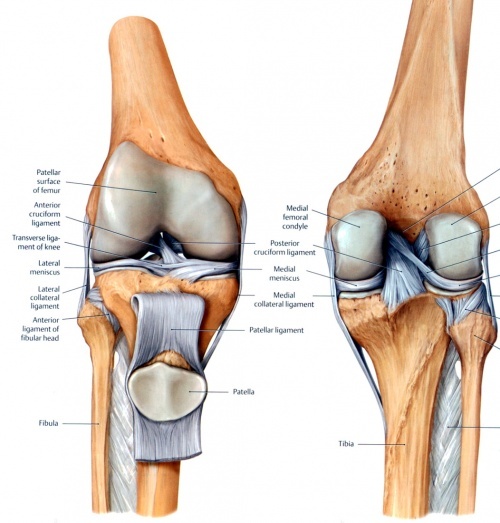 The knee joint is one of the largest and most complex joints in the body. It is constructed by 4 bones and an extensive network of ligaments and muscles. The thigh bone (Femur), the shin bone (Tibia) and the kneecap (Patella) articulate through tibiofemoral and patellofemoral joints. These three bones are covered in articular cartilage which is an extremely hard, smooth substance designed to decrease the friction forces. The patella lies in an indentation of the femur known as the intercondylar groove. The smaller shin bone that runs alongside the tibia (Fibula) and is attached via the superior tibiofibular joint is not directly involved in the knee joint, but provides a surface for important muscles and ligaments to attach to. The distal aspect of the femur forms the proximal articulating surface for the knee, which is composed of 2 large condyles. The medial and the lateral. These two condyles are separated inferiorly by the intercondylar notch although they are connected anteriorly by a small shallow groove which is known as either the femoral sulcus or the patella groove or patella surface. This engages the patella in early flexion. The tibia (shin bone) also has 2 asymmetrical condyles (medial and lateral) of which are relatively flat, These are also known as the tibial plateau. The medial tibial plateau is much longer than the lateral anteroposteriorly, and the diameter of the proximal tibia is much greater than the shaft posteriorly which is sloped at approximately 7 to 10 degrees to facilitate flexion of the femoral condyles on the tibia. The two tibial condyles are separated by the intercondylar tubercles, these are two bony spines which are roughened and their role lies within knee extension. They become lodged in the intercondylar notch of the femur, adding to the stability of the joint. Overall the tibiofemoral joint is a relatively unstable joint as the plateau's are slightly convex anteriorly and posteriorly. This emphasizes the importance of the other structures of the knee such as the menisci. There are two menisci in the space between the femoral and tibial condyles. They are crescent-shaped lamellae, each with anterior and posterior horn, and are triangular in cross section. The surface of each meniscus is concave superiorly, providing a congruous surface to the femoral condyles and is flat inferiorly to accompany the relatively flat tibial plateau. The horns of the medial meniscus are further apart and meniscus appears ‘C’ shaped, than those of the lateral one where meniscus appears more ‘O’ shaped. This is due to the increased size of the medial menisci, which unfortunately leaves a large exposed area that in turn can be prone to injury. The menisci correct the lack of congruence between the articular surfaces of tibia and femur, increase the area of contact and improve weight distribution and shock absorption. They also help to guide and coordinate knee motion, making them very important stabilizers of the knee. The arrangement of the fibres in the menisci allows for axial loads to be dispersed radially decreasing the wear on the hyaline articular cartilage. This is essential as the compressive loads through the knee can reach 1-2 times body weight during gait and stair climbing and an astonishing 3-4 times body weight during running. The menisci are connected with the tibia by coronary ligaments. The medial meniscus is much less mobile during joint motion than the lateral meniscus owing in large part to its firm attachment to the knee joint capsule and medial collateral ligament (MCL). On the lateral side, the meniscus is less firmly attached to the joint capsule and has no attachment to the lateral collateral ligament (LCL). In fact, the posterior horn of the lateral meniscus is separated entirely from the posterolateral aspect of the joint capsule by the tendon of the popliteus muscle as it descends from the lateral epicondyle of the femur. During the first year of life the menisci are fully vascularized but once weight bearing commences the vascularity diminishes to the outer third (red zone), the red zone being the only area having a slight ability to heal. The inner non-vascularized part (white zone) receives nutrition through diffusion of synovial fluid. The joint capsule has thick and fibrous layer superficially and thinner layers deeper. This along side the capsule ligaments enhances she stability of the knee. As with all of the structures that from the knee they are under most tension therefore more stable in an extended (closed packed) position in comparison to the laxity present in a flexed position (open packed). Inside this capsule is a specialized membrane known as the synovial membrane which provides nourishment to all the surrounding structures. The synovial membrane produces synovial fluid which lubricates the knee joint. Other structures include the infrapatellar fat pad and bursa which function as cushions to exterior forces on the knee. The synovial fluid which lubricates the knee joint is pushed anteriorly when the knee is in extension, posteriorly when the knee is flexed and in the semi flexed knee the fluid is under the least tension therefor being the most comfortable position if there is a joint effusion. 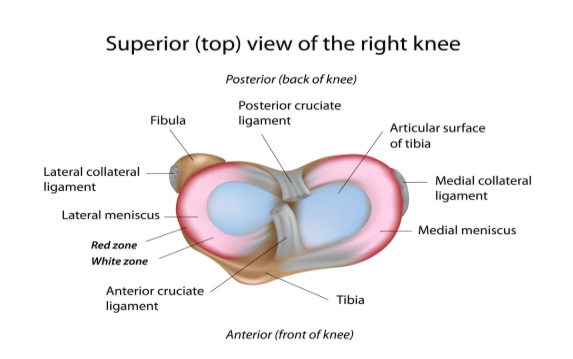 The ligaments of the knee maintain the stability of the knee. Each ligament has a particular function in helping to maintain optimal knee stability. 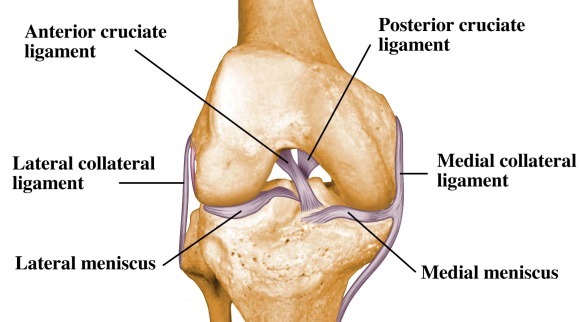 Medial Collateral Ligament (MCL) - This ligament can be divided into two sets of fibres. The superficial and the deep fibres. The general location of this band runs from the medial epicondyle of the femur to the medial condyle and the superior part of the medial surface of the tibia. The superficial fibres originates from medial femoral condyle and attaches to the medial aspect of the proximal tibia distally to the pes anserinus. The deep fibres are continuous to the joint capsule and originates from the inferior aspect of the medial femoral condyle, and inserts to the proximal aspect of the medial tibial plateau. In the middle of the ligament the deep fibres are attached to the medial meniscus. The MCL primarily resists forces acting from the outer surface of the knee, valgus forces, but also resists the lateral rotation of the tibia on the femur. The MCL is able to resist a valgus stress more effectively in the closed pack position (extension) due to the laxity of the ligament in the open packed position (flexed). The MCL does have another role in restraining anterior translation of the tibia on the femur. Therefore when someone has an MCL injury the protection of the anterior cruciate ligament needs to be considered. Lateral Collateral Ligament (LCL) – a cord like ligament that begins on the lateral epicondyle of the femur and joins with the tendon of the biceps femoris (hamstring muscle) to form the conjoined tendon. This ligament is different to the MCL and is considered to be an extracapsular ligament. It's main role is resisting varus forces on the knee, and similarly to the MCL is most effective in full extension. another similarity of the MCL and the LCL is the ability of the LCL to also resist lateral rotation of the tibia on the femur. Anterior Cruciate Ligament (ACL) - The ACL is an important structure in the knee for resisting anterior translation of the tibia on the femur. This ligament is a very well known ligament due to the high injury rate of athletes, which has resulted in a lot of research being done in the field of the ACL.. The cruciate ligaments are so called because they form a cross in the middle of the knee joint. The ACL, runs from anterolateral aspect of the medial intercondylar tibal spine superolaterally and posteriorly to the posteromedial aspect of the lateral femoral condyle. The ACL twists medially as it travels proximally. There are thought to be 2 bundles of fibres that form the ACL. The Anteromedial Bundle (AMB) and the Posterolateral Bundel (PLB). The ACL is responsible for resisting anterior sheering forces on the knee. Dependant on the position of the knee, will depend on which bundle of the ACL fibres will be taut. So when the knee close to full extension the PLB will be taut and resisting the force, but as the knee moves into a flexed position the PLB become lax and the AMB becomes taut taking over the role of resisting the anterior sheering forces. At approximately 30 degrees of the flexion neither of the bundles of the ligament are taut leading to the most anterior translation available at this range. It is most commonly injured in twisting movements.The ACL is also an accessory ligament in resisting rotary forces medially and laterally as well as valgus and varus forces. The PLB of the ACL is theorised to be most effective at providing rotary stability of the knee. In addition to this the AMB is under most tension at approximately 10-15 degrees of knee flexion with medial rotation. Posterior Cruciate Ligament (PCL) - This ligament runs from the posterior surface of the tibia between the two posterior horns of the menisci it then runs superiorly and anteriorly and attaches to the lateral aspect of the medial femoral condyle. The PCL is much shorted and less oblique with a much larger cross sectional area in comparison to the ACL. As the PCL blends with the posterior capsule as it crosses to the tibial attachment. Factors such as the size, shape and location possibly contribute to the increased strength of the PCL in comparison to the ACL and is much less frequently injured. The PCL similarly has 2 bundles of fibres the posteromedial (PMB) and the anterolateral bundle (ALB). When the knee is in near full extension the ALB which is much larger and stronger are lax and the PMB are taut whereas in 80-90 degrees of flexion the PMB are lax and the ALB are taut. The PCL is more adept for resisting posterior translation / sheering forces in knee when it is flexed despite there being the most posterior translation available at 75-90 degrees flexion. The secondary stabilisers at this point in the range are ineffective and relay upon the PCL. The PCL also plays an important role in resisting rotation and valgus / varus forces on the knee. The PCL best resists medial tibial rotation at 90 degrees flexion rather than extension, but is not very good at resisting lateral tibial rotation. If the PCL becomes damaged the Popliteus muscle plays an important role in stabilising the knee from posterior sheering forces. In the PCL deficient person hamstring contraction can destabilise the knee joint alongside a gastrocnemius contractions (at angles greater than 40 degrees knee flexion), whereas quadricep contractions degrees the strain on the PCL between angles of 20 and 60 degrees flexion. *- These three muscles originate from different bones on the pelvis, they perform different actions at the hip and are innervated by different nerves. Regardless, they all attach to the proximal medial tibia through a broad sheet of connective tissue known as the pes anserinus and perform flexion and medial stability to the knee. The ligaments and menisci provide static stability and the muscles and tendons dynamic stability. The main movement of the knee is flexion - extension. For that matter, knee act as a hinge joint, whereby the articular surfaces of the femur roll and glide over the tibial surface. During flexion and extension, tibia and patella act as one structure in relation to the femur. The quadriceps muscle group is made up of four different individual muscles. They join together forming one single tendon which inserts into the anterior tibial tuberosity. embedded in the tendon is patella, a triangular sesamoid bone and its function is to increase the efficiency of the quadriceps contractions. Contraction of the quadriceps pulls the patella upwards and extends the knee. Range of motion: extension 0o. The hamstring muscle group consist biceps femoris, semitendinosus and semimembranosus. They are situated at the back of the thigh and their function is flexing or bending the knee as well as providing stability on either side of the joint line. Range of motion: flexion 140o. Secondary movement is internal - external rotation of the tibia in relation to the femur, but it is possible only when the knee is flexed. Open kinetic chain - During knee extension, tibia glides anteriorly on femur. More precisely, from 200 knee flexion to full extension, tibia rotates externally. During knee flexion, tibia glides posteriorly on femur and from full knee extension to 200 flexion, tibia rotates internally. Closed kinetic chain - During knee extension, femur glides posteriorly on tibia. To be more specific, from 200 knee flexion to full extension, femur rotates internally on stable tibia. During knee flexion, femur glides anteriorly on tibia and from full knee extension to 200 flexion, femur rotates externally on stable tibia. The "screw-home" mechanism, considered to be a key element to knee stability, is the rotation between the tibia and femur. It occurs at the end of knee extension, between full extension (0 degrees) and 20 degrees of knee flexion. The tibia rotates internally during the open chain movements (swing phase) and externally during closed chain movements (stance phase). External rotation occurs during the terminal degrees of knee extension and results in tightening of both cruciate ligaments, which locks the knee. The tibia is then in the position of maximal stability with respect to the femur. ↑ 1.0 1.1 1.2 1.3 1.4 1.5 1.6 Sports Injury Clinic. Anatomy. Knee Anatomy. Available at: http://www.sportsinjuryclinic.net/anatomy/knee-anatomy (accessed 29 July 2016). ↑ 3.0 3.1 3.2 3.3 3.4 3.5 3.6 3.7 L. Ombregt. A System of Orthopaedic Medicine - Third Edition. Applied anatomy of the knee. Pages e262 - e269.Elsevier Ltd. 2013. ↑ Lam MH et al. Knee rotational stability during pivoting movement is restored after anatomic double-bundle anterior cruciate ligament reconstruction. Am J Sports Med (level b). 2011. ↑ Shingo Fukagawa. Posterior Displacement of the Tibia Increases in Deep Flexion of the Knee (level C). 2009. ↑ Rendale Sechrest. Knee Anatomy Animated Tutorial. Available from: https://www.youtube.com/watch?v=_q-Jxj5sT0g (accessed 29 july 2016). ↑ Surfwayne71. Knee - Surface Anatomy, ROM and Strength. Available from: https://www.youtube.com/watch?v=ZNzfJCIEkQI (accessed 29 july 2016). ↑ 10.0 10.1 Lentell G. The effect of knee position on torque output during inversion and eversion movements at the ankle. J Orthop Sports Phys Ther. 1988.